It is unknown if the shoes' recovery is related to any tip-offs. In press conference on Tuesday afternoon, no specific details were given about where they were found or how. FBI special agent Joan Sanborn indicated that the investigation was still ongoing. "We've gathered lots of information on this case. We believe there's lots more to give," she said. Who stole Burma's royal ruby? This pair was insured for $1m but experts have said they could be worth two times that now. 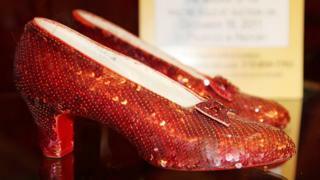 The Judy Garland Museum in Grand Rapids, Garland's birthplace, had been loaned the slippers from a collector named Michael Shaw. The theft was described as a simple smash-and-grab, with the glass display case destroyed and the slippers snatched. Almost no clues were left behind, neither footprints nor fingerprints, and the surveillance camera was not working that night. "I literally felt like I was hit in the stomach when I got the call," Mr Shaw told Newsweek in 2015. "My knees buckled, and I went right down on the floor. I had taken care of those shoes for 35 years!" Jon Miner, the museum's co-founder, told the magazine he was also devastated. "I cried," he said. "I couldn't believe this happened to us because it was the stupidest thing." A documentary about the theft - Who Stole The Ruby Slippers? - was released in 2015.